I understand that this is basically an Arduino running GRBL, but is there a schematic available? It would be a big help to those of us who want to tinker. I can figure things out myself if I have to, but spending a weekend with a DVM and a yellow pad to reverse engineer what is hooked where is not my idea of a good time - at least not like it was 40 years ago. If I wanted to roll my own solution, say using a G-Shield or a Tiny G, or my own PCB, would I still be able to use the Carbide Software with my XXL, or is there some sort of secret handshake that prevents that ? BTW - I was a little perturbed when I moved the gantry on my powered off machine and I realized that emf from the steppers was lighting up the controller. 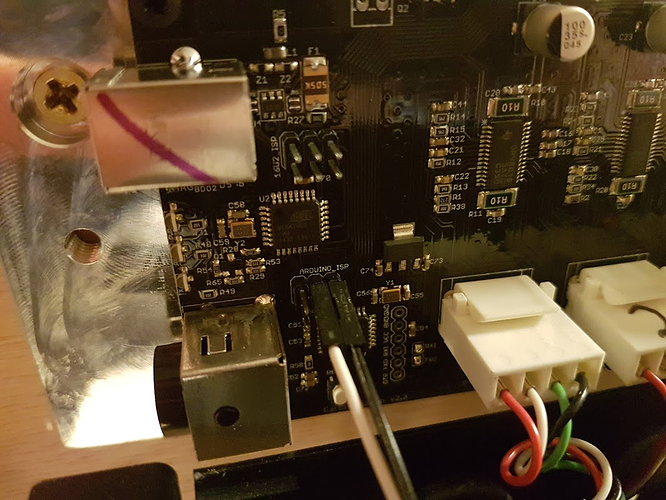 I’d also like to get rid of that jury-rigged capacitor, isolate the controller ground from the frame ground (and the router motor), switch to a more industrial power supply, and put a good LC filter in place if noise is still a problem. I think the system could be electrically cleaner than it presently is, and the present BFC (big “fancy” capacitor) fix reminds me of the sort of thing we are all guilty of late on a Friday evening when we get frustrated and desperate. Alright for the moment, but worthy of revisiting and refining when time permits. Mechanically I am mostly happy with the machine so far, although I too am wrestling with drag chains and limit switches (or lack thereof). Limit switches may not be a requirement for everyone, but I really hate that “braap” sound . Thanks to everyone at Carbide for all of their hard work. I knew when I ordered this machine that it was a new product, and that there would likely be a few rough edges. I’m sure you folks are hard at work smoothing those edges off. I hope things are going well for all the other new owners. Regards! And a list of alternatives here: http://www.shapeoko.com/wiki/index.php/Parts#Microcontroller — esp. Note the Sparkfun board. Hmm, sounds like a good excuse for acquiring that USB protocol analyzer I’ve been eyeing . Thanks Will. I can do most of what I have in mind without having to do a lot of research, but I do need to dig around and figure out where to hook up spindle speed control. I saw in the Wiki where you need to populate the missing header on the board, but I didn’t find the specific pinouts. Easy enough to figure out I suppose. The white and black wires. I use it for controlling laser intensity. Just remember it’s PWM at TTL levels only (5V). I appreciate your saving me from having to dig around for that. Laser, eh? I’ve been looking at laser heads with the idea of ditching my Chinese laser cutter. If you don’t mind my asking, what are you using for your laser? SO3: XL Arrived, Built, and tested! It shows the laser module and my mount for it for some ideas. I got it on ebay for about 120$ many months ago. 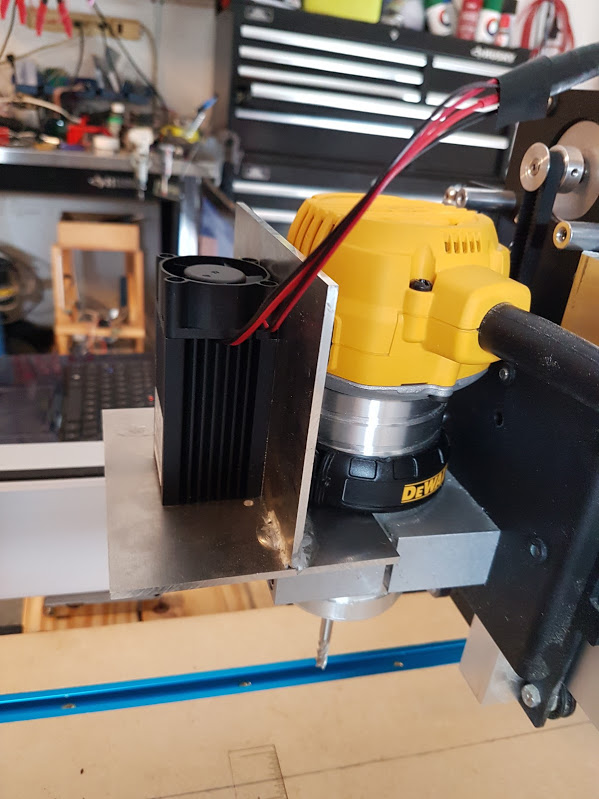 We also have a little bit about laser cutter heads for the Shapeoko on the wiki: http://www.shapeoko.com/wiki/index.php/Laser_Cutter — we’d be glad of more. FWIW in case anyone else is interested: I have ordered a sheet of electrical insulating thermal conducting material and some nylon screws so that I can isolate my controller from the frame. I will then try removing the kludge-pacitor, perhaps replacing it with something smaller that fits the board. Even if I find issues with the removal/reduction of capacitance, I prefer to switch to an LC filter rather than return to the BFC now installed. Also, because I have other projects on tap for which I need them, I have ordered both a Synthetos Tiny-G board and one of the Sparkfun Shapeoko controllers. Before they reach their final destinations, I will experiment with them on my XXL. Once I have spent some time with these various configurations I will share my findings with the group. Are you trying to build a better machine or one that suits your needs, wants, desires and slat on the world? I suppose I would have to say, “all of the above”. Meaning no offense to the guys at Carbide, who have in most respects done a great job, I am not completely enamored with their controller. Just as some folks on here are amazing woodworkers - far better than I will ever be, my primary skill set runs more in the area of electronics and embedded control, and industrial/military applications thereof. That, combined with my unsurprisingly ocd tendencies and compulsive need to ignore the rule that says, “if it ain’t broke, don’t fix it.” would probably be at the root of this exercise. I find that the solution which was used for the router noise issue is somewhat inelegant, and I think there is a better way. Actually I think there are a couple of better ways. Although I am on the road right now, when I have time I am going to explore these other approaches, and will share my results for anyone who may care, including the guys at Carbide. I also am considering a future upgrade from steppers to servo motors, and this will require access to the step pulse and direction signals. Some of the “sister boards” like Tiny-G and Sparkfun’s Stepoko have these signals broken out on headers, although I suspect it is possible to access them on the Carbide board. And finally, never underestimate my child like fascination with blinking lights. The other solutions have more available in the way of annunciators, which, shining through the transparent front of a plastic enclosure could keep me transfixed and entertained for hours on end. Although I have not placed either of the alternative boards in service yet, on a superficial basis I really like both the TinyG and the Stepoko. Assuming it proves itself in service, I would like to see Carbide adopt the Stepoko, which I believe already has specific support in their software. However, this is all a bit premature, and I hope to have something more substantive to share in the coming weeks. At one time the Carbide guys made a reference to their new board (the v2 boards) and that a “version of it would be available through sparkfun” - I’m not sure, but the current stepoko board at sparkfun might be that board. I have to admit, I like the sparkfun version better. It’s got appropriate LED’s for working out a lot of issues (for example, you would think diagnosing a broken limit switch would be easy…but it’s actually kind of a pain in the a**…a light on each limit input would make it trivial…the sparkfun board does…) The lack of back-emf protection is worrisome…I don’t think either board has it, but it would have been much better practice to do so. Having everything pulled out to at least a test point on the stepoko board is nice. Calling the BFC “inelegant” is a bit of an understatement. They use the same board in both the SO3 and the Nomad, with some parts depop’d on the SO3 version. The carbide board has 2 y-axis drivers, but the sparkfun board only has one. The carbide board has a feed_halt input that the stepoko board lacks. It’s not currently used, but they were clearly thinking about something there (there is also the obligatory e-stop…what the difference there is, I don’t know). The nomad has a spindle controller plugged into a connector that isn’t on the SO3 version. The spindle controller on the nomad could be more robust without adding any significant cost (at most a dollar or two). All of that said, don’t misunderstand me. They’ve got a pretty nice package all together. The guys are great to work with when you have a problem, they very clearly care about their customers, and they seem pretty supportive of all the odd things people are doing with their gear. I think they charge a reasonable amount for what they provide, and have done a lot of work to put together a set of products that work right out of the box. Perfect? No, but nothing never is, and they seem pretty open to constructive feedback. The four of them seem spread a little thin for what they’ve got going on, but I’m sure that will work itself out over a little time and we’ll see things get more polished. Keep us posted on what you do, I for one would love to see it. I’m currently trying to find time to experiment w/ a Gradus M1 Pro from Panucatt (putting it on my old Shapeoko 1 — but will also be trying to puzzle out the wiring to get it connected to my SO3). I hope no one feels criticized by what I said. I don’t think any of us have ever produced something with no room for improvement, and overall I think Carbide has done a great job. No serious complaints, just a little nitpicking around the edges. I really hope that some discussion is helpful, and might help refine things in future versions. Overall, I remain a big fan of what the Carbide folks are doing, and appreciate the way they handle issues, although I know some folks who haven’t been through a new product rollout before felt a little frustrated in the past month or two (understandably). Carbide has earned my business and my respect. The Stepoko is indeed our design. We gave them our design files but they needed it to fit in their enclosure so the outline and layout required changes. PS- We don’t call it the BFC internally, we call it the OS Cap. I doubt I will come up with anything of any significance, in fact one of the things I had considered (electrical isolation from the frame ground, and hence the router) has already been implemented for the Stepoko. But anything I do on this, assuming it has some slight merit, would be my donation to Carbide and the community. One of the things I am really pleased about is the great community which has formed around these machines. We have all seen situations where newbies were treated with contempt and derision, and a lot of sniping was the norm. Not so here. It would please me no end to contribute in some small way, as so many have contributed so much to make this a great experience.